LEN - www.lankaenews.com | Maithri who retreated like a shot rabbit back for another conspiracy –discusses secretly with SLFP seniors until dawn..! 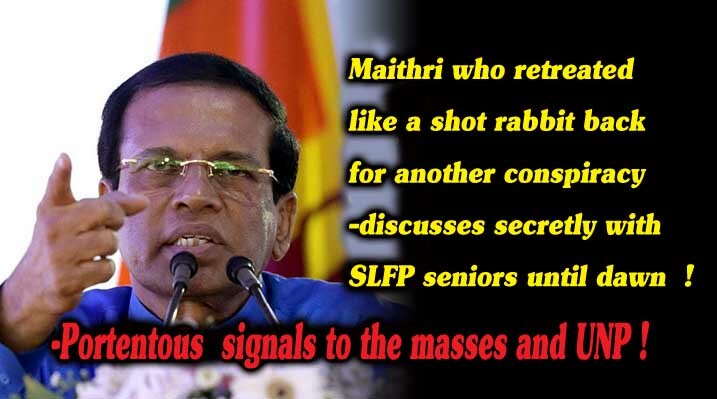 Maithri who retreated like a shot rabbit back for another conspiracy –discusses secretly with SLFP seniors until dawn..! -Portentous signals to the masses and UNP ! (Lanka-e-News - 20.Jan.2018, 7.55PM) President Maithripala Sirisena who literally ran out of the cabinet meeting on the 16 th saying ‘ I cannot run the government any longer’ had met with the SLFP seniors the same night to discuss the future course of (evil) action , based on reports reaching Lanka a news inside information division.This meeting has gone on until dawn. The discussion started with the presidential term .. The president who was made a Sillysena by DilanPerera , Faizer Mustafa , Shiral Lakthileke and judge Chitrasiri by following their advice that he can be in power for 6 years confessed ,owing to this misdirection he is now in deep despair and trauma. The president who wanted to add an additional year to his term , and use the court verdict to his advantage at the up coming elections has bitterly and profusely blamed Dilan , Faizer and Shiral .The president has lamented , Dilan and Faizer have been unrelentingly prodding the president since a year ago to seek Supreme court opinion to get another year added to his presidential term. A senior lawyer on the other hand among the SLFP seniors has asked the president why he followed the advice and legal premise of brief-less lawyer Shiral Lakthileke after knowing well the putrid antecedence of Shiral , the lawyer alias liar with the rare inglorious distinction of having never won a case in his whole lifetime .The seniors have blamed the president for not seeking their advice at least in relation to the presidential term. Based on the recent Gallup poll results (survey on possible polling results) pertaining to the forthcoming elections , the Maithri SLFP group will poll only 13 % of the votes. The president has revealed that a majority of the people have come to know of the true situation, and even after banning Lanka e news , the latter is lambasting him. Hence the best course of action now is ,like how he walked out at the cabinet meeting , the SLFP ministers too should resign their portfolios and face the elections as an opposition , which would be advantageous .This is the edge Mahinda Rajapakse is wielding and that can be grabbed to their hands , the president has suggested to the seniors. All the seniors have resisted that proposal , and told in one voice , at this juncture they cannot resign their portfolios. It was their view if elections are sought sans government’ power and portfolios , even the votes they could secure will be lost. The people vote at the local body elections on the belief they can get things done from the government that is in existence , and if they cross over to the opposition , even those who want to cast the votes to them would vote for the UNP, they had pointed out. Following this objection the president has withdrawn his proposal . The entire crowd had assented to the second strategy , that is somehow mount criticisms and opposition against the Prime minister (P.M.) Ranil Wickremesinghe to oust him prior to the elections using the presidential powers , and form an SLFP government .The seniors have told , towards that end, the anti Ranil UNP M.P.s shall be roped in , and finances for that can be collected. In case a UNP senior minister instead of an SLFP er is made a P.M. again , the necessary number of M.P.s of the UNP for that will not be difficult , the president has revealed. The Seniors had concurred in that. In the event of the SLFP securing very few votes , it would be impossible to do anything which are being proposed , and therefore whatever that must be done should be done one week before the elections , at the discussion it was pinpointed. Though two names of the UNP were mentioned other than Ranil for the post of P.M. , Lanka e news prefers not to reveal them right now. Accordingly ,it was decided , from the 17 th the view shall be propagated with vehemence among the masses that “P.M. should resign’ while the president instructed that this should be conveyed to the presidential media unit to ensure this is commenced on the 17 th itself. Warning of danger to UNPers..
President Sirisena ,when the last General elections were around the corner , ousted the secretaries of the SLFP and UPFA thereby plunging the Rajapakse ‘s election campaign into chaos and confusion . His present conduct is reminiscent of what he did then. This time he is trying the same insane but stealthy moves to scuttle the UNP election campaign and change the P.M. In the circumstances the UNP must plan how to counter this conspiracy. It must decide whether it should mollycoddle Sirisena (the serpent that gobbles hoppers , is much more dangerous than the serpent gobbling eggs) , and face the same debacle it suffered in 2002 ? Or explain clearly to the pro good governance masses who are reposing faith in it , and hit back so that it can safeguard its self respect . It is high time the UNP leader took a final decision in this regard. It is because of the injudicious decisions taken by the leaders , the UNP was deprived of its governmental powers in 2002 despite the party enjoying immense support of the people . If the UNP is to allow a repetition of it now , it is best the second row leaders and UNP ers realize before it is too late that , this time they will not be able to come to power again for another 20 years . It is their duty therefore to compel the leader to take right decisions and act with perspicacity . This exposure was made of double faced Sirisena not by his foe but by a friend and party member Isura Devapriya . Unbelievably , it is the highest in the hierarchy in the country , president Sirisena who should be promoting and holding aloft the rule of law instead is encouraging lawlessness , by ordering the FCID chiefs to halt the investigations in regard to the 8 massive frauds of Dilan Perera when all the facts and figures are ready and available with the FCID. It is well for Sirisena to remind himself that he was able to creep into the presidential position on the votes of the UNP and the pro good governance forces. Hence the pro good governance masses and the forces that defeated the SLFP rogues earlier have no necessity at all now to join with these same rogues . What these rogues who are flocking together are seeking to do is, multiply their ill gotten wealth manifold along with their brothers , son, daughter and son in law .. not enough the plunder they have committed already at the expense of public funds. After blaming the Rajapakse rogues , now these rascally culprits are trying to break the corruption and fraud records set by the Rajapakses during their reign. It is significant to note , president Sirisena has still not until today , explained how his son in law Thilina Sampath is able to wear a wristlet worth Rs. 8.8 million and a waist belt worth Rs. 6 million despite the glaring exposures of this obscene ostentation. In the circumstances , it is little wonder why Sirisena is leaving no stone unturned to tenaciously hold on to the anti Democratic abominable executive presidency power , without which he cannot shield and safeguard the corrupt and the crooked , including his own kith and kin. It is therefore high time the people take to the streets against these villainies , perfidies and state plunders.